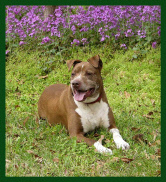 We are a small rescue in central North Carolina, devoted to finding loving, caring, permanent homes for dogs in need. We have 5 rescued dogs of our own and began assisting with rescue transports in the spring of 2005. In doing the transports and making contacts with various rescue agencies, animal control officers and shelter volunteers, we realized the need was overwhelming for places to get dogs deserving a second chance to safety and began fostering dogs in the summer of 2005. Many of the shelters we assist are in very rural areas and have virtually no adoption traffic. Some of the shelters are not well-funded and can be scary places for the public to visit. We provide a temporary home where the dogs can get out of a shelter environment or away from an abusive or neglectful situation and actively work to find qualified permanent homes for them. We are a registered non-profit corporation with the State of North Carolina and have been granted 501c3 status by the IRS. Donations to Cedar Farm are tax-deductible. Saving dogs is hard work. It is very time-consuming and we are often discouraged by the sheer number of wonderful dogs that we are unable to help. Any doubt that this is what we should be doing was erased when Buzz, a long-term foster, literally saved one of our lives. It became more than our passion and we know this is what our life’s work is meant to be. A rescued pit bull is the reason we are here, alive and able to do what we do.